As stated in a previous blog, “contrary to contemporary folklore, many New World settlers were more inspired by potential economic gain than religious conviction”. However, the decision of those seeking religious relief, stemmed from the confiscation of an interdependent (monarch-politicians-clergy) process by Ideological forces. Their concerns were codified when Queen Elizabeth I sanctioned the 1559 Act of Uniformity that imposed the Book of Commons on all belief systems. It passed through the House of Lords by only three votes, and all the clergy except those imprisoned by the Queen, voted against it. Many Pilgrims and Puritans, Protestants to a differing degree, headed for the New World along with those seeking fame and fortune – and the embarrassingly poor who were forcibly evicted from the streets of London. In 2018 there still remains but a remnant of difference between freely adhering to ones chosen moral convictions – and the legislative imposition of moral uniformity. Recently the voters of both the City and County of Los Angeles passed legislation directing billions of dollars to mitigate regional homelessness, now at epic proportions. The humanity and heartfelt empathy of the regions voters cannot be debated. While these propositions were gracious and generous, would the standards embraced by the regions elected representatives be any less ideological than was the 1559 Act of Uniformity? In 2017 one of the largest and most comprehensive emergency services providers in the US served over one million meals and provided a half million shelter nights – and did not turn away a single woman or child, no matter the stress on staff and resources. While this provider has maintained a religious affiliation for the past one hundred and twenty-five years, it has never once differentiated in the level of services or resources provided to those in need – nor does it require guests to embrace or acknowledgment its beliefs. The organization’s laudable performance is well established and its exemplary financial management well documented, e.g. it posts its audited financial statement for public review. Nevertheless, this organization was advised by regional government counsel, that unless it provided written repudiation of its religious affiliation – as are others – it would not be awarded any of the new funding. With no New World which to banish the homeless or those in need of emergency services, the City and County of Los Angeles have nevertheless imposed their own ideology inspired 2018 Act of Uniformity. Thoughts have the potential to defy convention, challenge expectations, repudiate traditional beliefs – to encourage and to dissuade, to affirm and forbid, and to support and suppress. Thoughts cannot be mediated by referendum or confined by the strictures of science. Thoughts may enjoy long and short-term tenure. Thoughts may inspire comfort or disquiet conflicted by current reality. Thoughts are the personal jurisdiction where ethical, relational, civil, and social comportment gestate. Thoughts and speech are intractably entangled – the former revealed by the later. Because out of the heart the mouth speaks – to know others requires a willingness to hear others. Words released from the confines of thought have their own capacity for engagement. Some words can be countermanded by other words, but not all words can be annulled. Leaders, parents, colleagues, and friends, have on occasion released irretrievably harmful words. However, it is the genesis of the thoughts behind the words that warrant examination to discern the presence of deception and aberrant intent. No act more effectively empowers deception than silencing the thoughts of those with whom we might not agree – just as no act more effectively plunders deception than exposing it to virtue and truth. Such authenticity is more accessible than most realize, however, ideology is a narcotic that subverts appetites for other than its points of view. While many nefarious and noble thoughts never rise to the level of engagement, thoughts inhabit words, and words are often a harbinger of incontrovertible actions. Control of actions and outcomes are intractably related to formation and dissemination of words. The United States of America (US) was so dedicated to preserving the rights of citizens to cultivate and express thoughts via words, it made freedom of expression a cardinal tenant of its canon of rights – not subject to government interdiction. Thoughts in the form of speech undergirded the most powerful of social transformations – e.g. Civil Rights, Voting Rights, Immigration and Education Reform – in the most powerful country in the world. Yet ideology brazenly conscripts those who’ve benefited the most from freedom of expression in its quest to move up the stream-of-personal-consciousness to subvert thought. The title of a recent best-seller about Russia reveals ideology’s vaporous attraction – “Nothing is True but Every Thing is Possible”. Ideology’s quest to capture the transforming power of words is intended to banish thoughts – not speech – it disapproves of from the public square. Ideology exploits a not so obvious but highly effective strategy; it contends that the battles that matter are economic, racial, and gender based e.g. intersectional – as opposed to those attendant to preservation of thoughts, words, and actions, informed by truth and morality. Deception, the patron saint of Ideology, requires a steady diet of conflict and discord. Culture is both a means of communication and compression. It broadly communicates group perceptions and preferences, and compresses past experiences and decisions into inclinations expressed in the now. Even though it is often referred to in dissected terminology – e.g. me, them, and they – culture is foremost about we. There is no such oasis as solo-culture; culture exhibits inclinations that reflect the hierarchical and linear integration of nationalism, ethnicity, economics, politics, religion, customs, and passions. American culture derives from a powerful multi-articulated social mechanism, where the who-you-are derives from both transient and static inclinations – the unique you is free to influence many different assemblies. Besides belief systems, thoughts, and speech – ideology has also planted its flag in the hierarchical and linearly integrated American culture. While its constitutional blueprint suggest America is dynamically and inherently resistant to cultural hegemony, ideology has found a highly receptive and near perfect host for its deceptive and divisive intent. Social elixirs that inspire appetites for ideology over morality and truth have diminished American immunity to cultural subversion. Ideology like cancer relies on its difficulty to be detected, as it subverts healthy potentiality to foment disaster. How did such a vibrant virtual culture, like that pervasive in America for over two hundred years, lose its vitality? It didn’t. Its vitality was expunged when the voices of truth abandoned their posts. Absent true moral reference, those nominally addicted to ideology maintain a frame of mind that insists, “If I’m dancing with deception, just keep the music playing”. Be aware, Ideology only mixes tacks to its own beat, not yours. Believing ideology possesses authentic and sustainable power – the unsuspecting and addicted hordes surrender their personal prerogative (free will) to its self proclaimed counterfeit authority. Ideology proffers Cadillac promises designed to attract and imprison the human will, and to evade accountability to the truth. Ideology infects party orthodoxy, converting its members into Red and Blue tricks. Many are unaware that the ideology they serve has diabolically different objectives than their orthodoxy espouses. Truth can never reach an armistice with ideology – as they are the progeny of two wholly different jurisdictions that predestine opposition. Truth transpires from transcendental spiritual agency, whereas ideology is dependent on division, deception and exploitation of cultural agency. Because ideology presumes itself as sovereign, right and wrong, good and evil, and you and me, are subject to its sole adjudication. Ideology does not abide questions or debate – only full and immediate compliance will be tolerated. There exists within the Homo sapiens1 core a prescient connection to purpose – eternally unbounded by time, space, or matter (spirit), and animated interests – that eternally liberates creativity from the internment of reason (soul). The entanglement of spirit and soul inspires engagement by temporal corporeal-synaptic agency (body). Many sense this multidimensional agency; few realize its genesis (origin) resides in the human spirit. Note1: Sapiens is technically an adjective, but herein denotes both singular and plural forms. While engagement is the progeny (offspring) of Sapiens intent, the confluence of spirit (morality) and soul (aspiration) is where intent gestates. Intent can be actualized in kinetic (active) states, e.g. standing and singing, and static (passive) states, e.g. kneeling in silence. Regardless of state, engagement reveals the nature of the spirit – truth or deception – that the soul sanctions, and it alone rewards with corporeal-synaptic agency. Deception inspired spiritual agency (strategic deceit) has powerful capacity to influence the human soul. However, truth-inspired spiritual agency (divine purpose) also abides; it grants both the power to discern deception and to obtain revelation to the human soul. Yet, a soul that affirms deceit opens a portal by which deception begets fraudulent engagement, which engagement begets division, where after division begets disaster. A broadly disseminated narrative contends that police have disproportionate violent encounters with young African American men. This point was defended on a recent National Broadcast News Program by an African America trial lawyer who: used word symbols and slogans, but just one fact and no details to provide context to the narrative. The following evening, the same News Program afforded an African American lawyer from the US Commission on Civil Rights the opportunity to respond to the trial lawyers assertions. The Commissioner used Department of Justice data and copious Commission studies to prove that the assertions pivoted on a word – disproportionate – not facts. In New York, young black men commit 35 times more robberies, 38 times more murders, and 51 times more firearm-related crimes – than do whites. In 2015 police killed 36 unarmed black men, while other black men (mostly young) murdered nearly 6,000 other black Americans. Young black males make up 42 percent of all cop-killers over the last decade. Perhaps the most sobering revelation is that of the 7,881 African Americans murdered in 2016 – the overwhelming majority were murdered by young African American males between the ages of 17 and 34, less than 1.5 percent of the total population. Many African American professional athletes – and others – are exercising their First Amendment right to protest what they see as disproportionate treatment of young black men by police. Not surprisingly, the young men on whom the protests focus fall within the same age range (25.5) as the protesters (NBA: 26.5 and NFL: 25.6); many hail from the same archetype communities. Undoubtedly many of these athletes, no matter their salaries, have unique insights regarding the plight and experiences of this group – and processes by which they can overcome their difficult and self-destructive challenges. Who is better positioned and accomplished – to mentor this group – than these athletes? The protesters infrequent articulation of details and facts that reveal the marrow of their cause – beyond talking points and slogans – organically accelerates division. It has led many to conclude that these athletes are unaware of the well-established data and facts that impair the potency and piety of their protests. The infectious kumbaya (feelings) between players and owners does not reflect a perfect union, given fierce fan base opposition (reality). Division always seeks to substitute feelings in place of reality. First and foremost the Flag is not a symbol of a perfect union but of the sacrifice of life and limb by all members of the National Community to include African Americans (54th Mass. Infantry, Abolitionist, Tuskegee Airmen, and many Medal of Honor recipients). Various protesters seem unaware or unconcerned that casting the Flag in the shadow of wanton murder of private citizens by private citizens (a symbol pivot) is hugely divisive. Contrary to popular convention, division is counter-intuitive to both those harboring noble and nefarious intent. Some choose: to destroy and disparage, oppose and oppress, disrupt and dispose, challenge and co-opt – yet others choose to collaborate and coordinate, plan and produce, share and sacrifice, encourage and enable. No analytics provide plausible incentive to embrace division over allied engagement. Both divisive and allied engagements are the progeny (offspring) of radically different geneses, which reveal which spirit – truth or deception – the soul has elected to sanction. It’s no coincidence that the terms used to describe divisive engagement are the same as those impartial scribes use to critique military conquest, political retribution, economic calamity, and acts of terrorism; division – the progeny of deception – foments disaster. The terms used to describe allied engagement are often the same as those impartial scribes use to critique military forbearance, political discourse, economic propriety, and acts of selfless generosity; allegiance – the progeny of truth – empowers relationship. Once the human soul has elected to collaborate with the spirit of deception, the corporeal-synaptic-self engages as an enraged opponent of truth. An effective strategy for controverting truth is to supplant free speech and access (First Amendment Rights) by force and disparagement. Sources that expose deception are often attacked, and credible facts are bleached to oblivion by fake news and rebukes from celebrity scions. Truth is eternal: it does not originate in the temporal corporeal-synaptic realm. Eternal truth is not reasoned conclusions fashioned from data, facts, circumstances, or season. Eternal truth cannot arise from nor survive on the basis of religious, cultural, or political ideologies. Ideologies are nevertheless the perfect companions to deception, cloaking deception in an opaque sea of familiarity. No matter the vigorous applause of agreeable constituencies, deception cannot survive the discerning and revelatory power of truth. Truth is both an Eternal Quality and a Source of Eternal Power – only when it is shared! It was the best of times. The accounting provided by the Jewish Torah and Christian Bible indicates that long before such a formal construct as history had been codified, Sapiens (triune-man) had brought their unique giftedness fully to bear. Having been granted dominion over the material world, their souls were constrained only by the boundaries of their uniquely animated reason, imagination, interests, and creator-ability. It was the worst of times. In the Garden, rather than a quest for new dimensions of Creator sanctioned dominion, sapiens desire for Creator like transcendence exposed their vulnerability to treachery. The father of deception counseled that All-Knowingness was but one bite away. Sapiens bite at All-Knowingness proved both catastrophic and generationally contagious, genetically encoding desire for creatoresque Self-Providence. It was the best of times. Sapiens, ensconced in a flood-free enclave, sought a symbol to undergird their resistance to divine direction to disperse. The Tower project symbolized permanence, possibly arresting the neurosis induced by the continuing phenomena of rain; the rainbow contract offered little consolation. The Tower provided scant strategic advantage – e.g. reconnaissance of storm clouds on the distant horizon; nor did it impart tactical efficacy – e.g. training to develop critical skills that might serve them well in the future. The Tower was a monument to the first Sapiens inspired permanent city-state. It was the worst of times. Some aspirations inspire the onset of opiate-like addiction – which disengages spiritually gestated moral authority and imperils social and personal accountability. Sapiens, no less vulnerable to spiritual deception than ages earlier, determined they’d restore their divinely diminished creator-ability through enhanced collaboration. The Tower actually evidenced a new genetic mutation of an old sapiens weakness with contagion potential: Self-Sufficiency born of counterfeit All-Knowingness. It was the best of times. The sages of Melbourne, Palo Alto, Cern, Beijing, Tel Aviv, et al, synchronized their breathing as the technology mother ship arrived and breached the zone where virtual-digital-knowledge resides. This zone is the by-product of a Sapiens induced digital big bang, which formed a network-centric-ecosystem comprised of many interoperable jurisdictions, e.g. computing, communications, storage, big data, analytics, and applications. This distant digital relative of the analog Tower is called the Cloud. The Cloud is delivering unprecedented benefit; it has brought huge global value directly to the desktop and smartphone, and similarly enabled individuals to broadly touch the outside world – e.g. this blog. Few products, services, relationships, or destinations, are beyond its reach. Many presumptively declare the Cloud as wise, declaring it the sovereign authority of who and when. Many believe that the emergence of quantum computers and artificial intelligence will enable the Cloud to better “amplify the power of machines, the power of one, the power of many, and the power of flows1“, advancing sapiens beyond Self-Providence and Self-Sufficiency, to the portal of Self-Supremacy. It was the worst of times. The Cloud alone adjudicates digitally articulated policy in its own interest, e.g. elevating All-Knowingness over Personal-Privacy. Destitute of social or psychological discernment, the Cloud is wholly incapable of distinguishing those of noble intent from those of nefarious intent: governments in the name of national security and criminals for personal gain, competitors for strategic advantage and businesses for commercial leverage, and terrorist for political conquest and rebels for thrills. The Cloud enables little more than nominal attributes of privacy, by way of anonymous trusted-third-parties, proxies, and vulnerable security technology, of it’s choosing. It also offers the opportunity to surrender to Big Data and Analytics agency simply by clicking “I Agree”. The Cloud is considered to be rapidly evolving from a kluge-of-capabilities to cogent-entity status; many believe it exhibits pseudo-sentient analytic proficiency. Nevertheless, the Cloud remains highly vulnerable to nefarious human agency, which uses it to alter past and present accounts to form a new you of their choosing, e.g. profiling. Often the Cloud is positioned where principles, not binary data, ought to moderate. The Cloud now undergirds political party hostilities by furnishing weapons grade accusations and innuendo; its social network agency has abated the tactile connectedness critical to maturation of inter-personal skills. The Cloud has no master, yet it remains connected to an evergreen supply of covert and clandestine information-nutrients. Laws, standards, and threats are powerless to thwart or restrain Cloud-sourced virtual-synthetic-facts. The view from above the Cloud: While deception dons coats of many colors, pride is the color it uses to subvert well-being and foment catastrophe. All-Knowingness was the shade of pride donned by deception in the Garden and Tower, and now the Cloud. In the Garden, deception championed Self-Providence; shame and eviction are what followed. In the Tower, deception held out the illusion of Self-Sufficiency; thereafter, diminished collaborative facility was necessary to thwart a new global contagion. The Cloud – envisioned as master-servant of sapiens quest for All-Knowingness enabled Self-Providence and Self-Sufficiency – has been besieged by powerful and unrelenting cyber espionage, subversion, interloping, piracy, mass surveillance, and profiling. As in the Garden and Tower, the Cloud opines to discordant spiritual revelation and displaced moral integrity. While direct personal control of privacy and security would substantially thwart such Cloud misadventure, true resolution requires the Words of the Creator to reside in the Hearts of Sapiens – not acts of Congress, Courts, Corporations, or Churches. For many, the relationship between Ahab and Jezebel elucidates a drama wherein a vulnerable Ahab is victimized by the beguiling femininity of his lover, Jezebel. Neither presumption is true; they are co-dependent conspirators who harbor nefarious intent. Predisposed to fraudulent posturing, Ahab evinces dispassionate jurisdiction, whereas Jezebel predisposed to irrepressible prerogative savors fraudulent jurisdiction. They are catalytic accomplices, whose fraudulent-transfer-of-authority is devoid of moral fidelity. DNA – a double-helix structure that contains unique genetic instructions present in every cell of the body – arises from the bonding of complimentary molecular agents. Ahab-Jezebel Syndrome – a double-helix psychosis that induces fraudulent-transfer-of-authority – arises from complimentary disposition (immorality) and spiritual mutation (deception), which portends disaster for Social, Sacred, and Secular institutions. Like a low-grade fever that precedes the onset of debilitating infection, Ahab-Jezebel- Syndrome first entreats collaboration (fever) and then acts to impose subordination (infection). Ahab-Churches unceremoniously surrender their jurisdiction to the dominion of Jezebel-States (government, business, media, academia), who greet fraudulent-transfer-of-authority with both a sense of rightful expectancy and finality. Induced by the spirit of immorality and deception to dispossess authority, the contemporary church has abdicated its responsibility for moral oversight of: politics, culture, education, economics, and sexuality. Addicted to wanting-what-it-wants, Jezebel-States alone fill the vacuums; they act aggressively to institutionalize these windfalls of authority, which enable them to define success, failure, and spirituality as they so choose. All except staged-contention is vilified as barbarism and social sacrilege. Repudiating the sovereignty of the source, fraudulent transfers of authority between Church and State are represented as – occasions were enlightened lovers experience beneficial and enduring cohabitation. These lovers trust the cultural and political devices they employ will obfuscate the immorality and deception that inspires their union. While the State has gained jurisdiction as sole moral arbiter of its own decisions and behavior, the Church has gained but trinkets: lumps of coal in their capital stockings and photo-ops that only impersonate power sharing. With jurisdiction of both capital and moral authority, States seek final consolidation – radical transformation of the Family. If the only One with the power to sanction these institutions is yet cogent and sovereign, will there be rectification? Jezebel-States are actually the boots who march to the beat of Ahab-Church dysfunction. Having bartered away actual for titular authority, garnering little more than a muzzle and blindfold – the Church had better batten its hatches. Genesis and genetics set forth the proposition that evolution and devolution derive from seeds; sapiens experiences of consequence involve one or both. However, moral momentum first gestates in the spirit, promulgates influence of the soul, and finally transforms conscious perspective and behavior. Both the nefarious and noble acts of men are: spirit-groomed, soul-sanctioned, and sentience-enabled. While we are infused by what we eat, we are only imbued by what we think and that with which we agree. It is not unreasonable to be disconcerted by our failure to foresee the inconceivable in others. However, transcendental-progression – e.g. spirit-soul-sentience – telegraphs our personal inclination for the implausible. We are alerted by a sense of transformation as the seeds of potential impound our cognitive and kinetic energy to actualize their noble and nefarious destiny. Whether moon landings, mass shootings, cancer cures, financial fraud, good samaritism, terrorism, philanthropy, or maleficence under cloak of authority, each evidences transcendental-progression; timing remains the only unknown. Deception exploits our predilection for psychological assessment of nefarious and noble acts. Whereas many believe the confluence of genetic and environmental triggers codify subconscious intent, deception requires a more amenable agency than transcendental- progression. Deception fully embraces natural-progression – e.g. genes-environment-sentience – that supports the illusion that the implausible and inconceivable can be predicted and controlled. Billions are being expended in search of a behavioral-genome having the potential to avert the next Boston, Paris, Brussels, Orlando, and Nice. Despite a preponderance of experience and evidence to the contrary, many subscribe to the notion that natural-progression informed politics, economics, and social science can re-seed human inclination. Yet, human history confirms that privilege and disadvantage, intelligence and ineptness, affluence and poverty, aggression and complaisance, refinement and inelegance, cohabit both ascendant and subservient potential. Deception dismisses such powerful evidentiary continuity – supplanting light and accord with darkness and friction to wrest control of the human conscious. Division is the first born of deception. It squanders no opportunity to divide: e.g. Jew and Gentile, Shia and Sunni, Hutu and Tutsi, Turk and Armenian, North and South, East and West, Red and Blue, Black and White, and Top from Bottom. Deception disavows coalescence in order to first kindle and then enrage division, no matter urgent protests and unassailable consensus. Division is a far more verbal than tactile proceeding; it burns from both ends of the tongue to inculcate destructive mischaracterizations. Division is the mother’s milk of politics. It perpetrates a war of attrition predicated on salvos of improbable promises from principle-deficient political operatives. Their goals are: to obtain and retain constituent support while distracting attention from off-putting ideology, and to accumulate unmerited personal resources and power. Politics confirm that division is highly addictive for both operatives and constituents. No political constituency on the planet has managed to alleviate division-addiction for any sustained period. Division-addiction reveals politics as a two-division two-team blood sport – hustlers and the hustled versus hustlers and the hustled. Division is the loyal mistress of economics. Artificial economic-division (American style) partitions the absolute value of wealth into multiple groups, defining those in the bottom groups as the poor, and those in the top groups as the rich. Such division is much more likely to deceive than to inform; e.g. the value of entitlements (food stamps, housing allowances, healthcare, childcare, et al) are excluded when assessing the quality of life available to those consigned to a bottom group – wherein many live on par or better than the global middle class. Division disparages economic differences without accounting for personal sacrifice, preference, or giftedness, and commutes personal prerogatives into human rights as it sees fit – absent probity or equity. Supply-and-demand has long served as a reliable macro-economic barometer of stock market volatility and risk. Market apparatchiks and their math-quants have learned to exploit stock market volatility to abate proportionate investment risks. The staggering difference in presumptive wealth between those defined as rich and poor derives largely from the return on investment afforded these apparatchiks and their clients. Economic division is deception-infected; the shroud of inequity is cast over many more than the one tenth of one percent who actually garner such risk-redacted gains. However, economic-division is also self-seeking; the unaffected offer little sympathy when wild swings in market confidence sack the values of apparatchik stock portfolios. Division maintains social science on retainer and first call. Principled social science seeks to better understand cause and effect, and in turn how to induce the beneficial and control the implausible. Deception-infected-division restricts the basis of social science to natural-progression, opening many paths by which to foment and justify group isolation and disruption. Social-division nourished by deception has achieved pandemic scale; no people, nation, or kingdom has evaded its pernicious disfigurement. Morning: Of the eleven million people involuntarily extracted from West Africa, only two percent would be settled in the south of North America; many would endure well-documented atrocities at the hands of brutal masters. Today, direct descendants of this racial caste: comprise the 16th largest economy in the world; can boast of noted leaders of government and transnational business enterprise to numerous to mention; have achieved a level of formal education rivaled only by the majority national community; and are the most literate of all diasporas of color – so much from so little and so few. Evening: Inexplicably, over the past thirty years a small cadre of young men from this remarkable community are irrefutably responsible for more than fifty percent of all domestic homicides. In 2015 this cadre would murder 6,000 members of their own community. Concurrently, many young members from this community would exercise their constitutional right to protest the use of lethal force by police in the deaths of 36 unarmed community members – never mind that at this rate of engagement Police would require over forty years to murder on par with this small cadre in one year alone. Disaster: Regardless of the facts, deception enables politicians, journalist, and self-anointed spokespersons to dispossess this remarkable community of the pride, reputation, and self-confidence it’s accomplishments warrant. Further, agents-of-deception have cast this largely progressive and law abiding community as intractably dependent (entitlement addicted) and morally despicable (promiscuous and profane). This community largely rejects this deceptive script, yet some choose instead to audition. Morning: Coalition, a first cousin of collaboration, has always been an essential element of human advancement. There are a number of well recognized coalitions – e.g. the North American Free Trade Act (NAFTA), the European Union (EU), the Asia Pacific Trade Agreement (APTA) – which ostensibly form larger trading blocks that are more competitive across global markets. There are also less formal constructs, e.g. alliances. Evening: Generally where the more competitive, e.g. Maquiladoras, displace the lesser competitive, e.g. Trade Union – the impact is first and foremost personal. Forecasts of consumer savings provide coalitions political cover, yet many companies retain the lion’s share of increases in margin – as Boards of Directors expect, and Markets demand. Disaster: No matter that efficiencies align and value accrues to all parties, deception lurks. China is exchanging infrastructure development in Africa for long-term access to natural resources. The EU constitution abetted cultural-division and ultimately defection (Brexit). NAFTA has pushed Americans both higher and lower in the middle class stack. Morning: While nations are but intellectual and geographic people progressions, kingdoms abide a different realm than do people or nations. Kingdoms operate only in accordance with transcendental (spirit-soul-conscious) not natural (genes-environment-conscious) progression. Science has confirmed that genes bare specific environmentally influenced instructions after which they enable specific biological construction – whereas spirit and soul cannot be confirmed or denied by scientific processes. Many of the intellectual elite insists that these progressions are complimentary like the double helix structure of DNA. Nevertheless after discovery of gene adaptation (regulate, replicate, and recombine), cogent consideration of spirit and soul was consummately disbarred. Evening: Observation and reasoned exegesis pushed such epiphanies as the renaissance, reformation, scientific revolution, and enlightenment to challenge and better inform the next sure thing. No sequence of epiphanies has confirmed the capacity of natural progression to account for deception. No outcome employing repeatable scientific processes has demonstrated genetic adaption countervailing deception. It is rational to conclude that deception is the progeny of transcendental not natural progression. Natural-progression can only exacerbate not disengage deception; darkness begets darkness. Only Transcendental-progression can ameliorate deception and its eternal consequences; light begets light. Each of us is required to choose and embrace but one of these points of reference. Question: Is it incongruous to re-examine faith-allied claims in the light of Science? No matter the genesis of inspiration, whether – vision incited by revelation, reason conferred by science, or the natural entangled with the transcendental – faith must be cultivated to engender affection, and engaged to actualize potential. This precept is fundamental; everything that exist and everything we are derives from this TripleLux. It is expressed poignantly by the familiar affirmation – faith without works is dead; said in context – inspiration begets cultivation, which begets actualization, e.g. Creation. Question: What are some plausible explanations as to the Inspiration for creation? Observation of cultivation and examination of actualization have increased scientific knowledge regarding cosmology, ecology, and anthropology exponentially; inspiration was considered too nebulous for scientific analysis. Given the interdependency of these three high science disciplines, it is reasonable to conclude they share the same modus of inspiration. Prior to the confluence of these high science disciplines, creationism – presented in just thirty-one succinct verses – provided the only complimentary account. This scientific tsunami has given inescapable gravity to but one term, Creator. 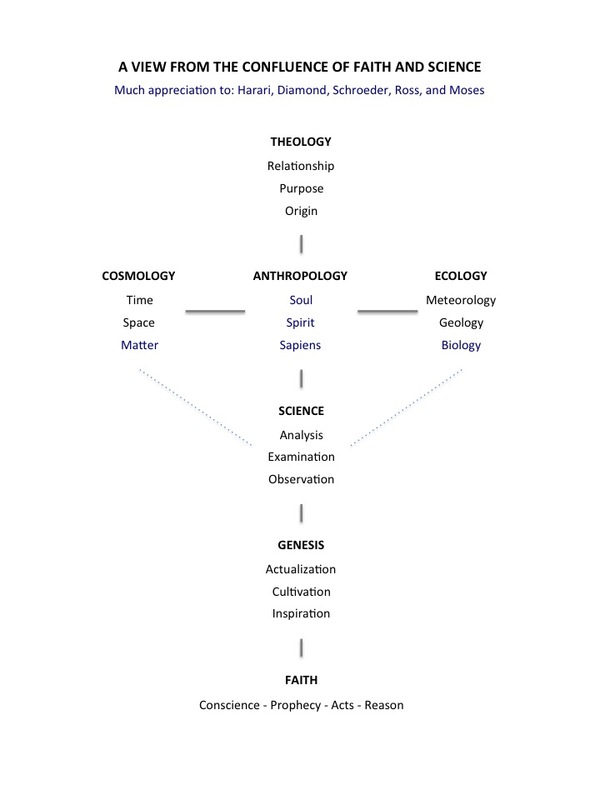 Question: Can Anthropology coincide with Cosmology/Ecology, but not Creationism? Cosmology is the scientific discipline that investigates the origin and development of the universe. While theories abound, the one exhibiting credible correlation between faith and reason is referred to as the Big Bang. Cosmologists describe the universe as the production of an intelligent beginner and a first cause event – from great nothingness. The COBE and Hubble satellites enabled scientists to determine the precise tempo at which the universe transpired. In the only precise accounting of record, the six periods – evening (chaos – ereb) to morning (order – boqer) – to include a final period of reference (one earth orbit) – ranged from millions to but thousands of reference-based years. Corroboration and illumination of this written account by credible mathematical and cosmogenesis analysis gives rise to but one description – Creator. Question: If Creation of the Universe was the Beginning, what was the End objective? Ecology is the scientific discipline that investigates organisms, physical surroundings, and the consequences of their interaction. Analysis of geophysical and fossil data has convinced scientists that the cooling of the earth and the appearance of water and sunshine proffered conditions conducive to the consequential-evolution of biological organisms. No matter debates regarding consequential-resiliency (e.g. global warming), the earth, atmosphere, plants, and animals form a highly complex relational-ecosystem, which boundaries must be understood and respected. Elementary science, observation, and intuition, embolden the presumption that within the relational-ecosystem the simple gives rise to the more complex. However, molecular biologists have discovered single cell plants with hundreds of times the genetic information per cell as mammals, but lack a plausible explanation as to the origin of either genome. No matter the possible scientific incongruity, the quest for planets evidencing hydro potentiality advances. Only one explanation coincides with earth’s genetically rich relational-ecosystem and congruent cosmological periodicity – Creator. Question: Does 2B yrs. of composition within the boundaries of kind refute Evolution? Anthropology is the scientific discipline that studies human beings and cultures. It is perhaps the most intriguing of all human interests, besides critical life saving therapies and protocols. Who are we (relationship), why are we here (purpose), and where did we come from (origin)? While relationship and purpose harbor overarching insight, for context and consistency we’ll follow the trail of origin to its intersection with the others. Biologically, modern humans are a part of the Homo genus and Sapiens species, of which there were many other species to include Erectus, Ergaster, and Neanderthal; only Homo sapiens survive. Credible scientific investigations repeatedly confirm the sudden not consequential-evolutionary appearance of Homo sapiens. Evolutionists continue to search for a direct link to other Homo genus, contending that Homo sapiens are mammal class evolutionary organisms, and like plants and other animals, are the progeny of the same relational-ecosystem. Further scientific scrutiny reveals that Homo sapiens genetic code is hugely different from other Homo species. Question: Why is it critical that Evolutionists directly link all Homo geniuses? Despite smaller stature and smaller brains than Neanderthals, Sapiens evidence incomparably advanced cognition and imagination, exhibited by no other Homo genus. The agility biologist, psychologist, and social scientists describe as super-intelligence, derives from impartation of prescient-connection unbounded by time, space, or matter. Homo sapiens uniqueness – the ability to see what did not exist as though it were, to modify ecosystem relationships to their own advantage, to achieve sufficient caloric intake in a fraction of the time and effort required by other Homo species, and to travel the breath of the planet – derives not from consequential-evolution, but impartation of spirit and then animation of reason, interests, and creativity, this screams Creator. Question: What does the gift of Soul and Spirit suggest about Relationship and Purpose? The development of narrative scripts (writing systems) for numbers and then language facilitated the archival preservation and broad dissemination of facts, fictions, accounts, and fantasy. However, narrative scripts were not nearly as proficient at preservation and dissemination of data as for information, likely inspiring and influencing development of computational scripts (mathematical systems). The analog embodiment of these scripts accommodated physical and access control of data and information. Analog vested scripts together with analog networks comprised of oceans, seas, rivers, tributaries, and estuaries, brought potent benefits to mankind. Collaboration among family, friends, foe, colleagues, and importantly neighbors, increased in practice and value, as did commerce. Digital scripts (binary systems) enable composition (production), preservation (storage), replication (virtual copies), and dissemination (distribution) of data and information. Importantly, they enable systems, devices, appliances, and applications to directly engage; machine-to-machine communication is a critical network centric process. The Digital Ecosystem and Monoculture rely on digital scripts. The Digital Ecosystem is enabled by: Network Service Providers such as AT&T, Verizon, Charter and Comcast; Network Technology OEM such as Cisco, Juniper, and HP; Mobile Architecture Providers such as Microsoft, Apple and Samsung; Application Portals such as Facebook, Google, and Yahoo; and Cloud Facilitators such as Amazon and IBM. The Digital Monoculture enables interoperability among disparate data, applications, and devices. The personal, commercial, and institutional benefits derived from global access to data and information, and Cloud facilitated on-demand digital resources, are apparent. The former aqueous networks have given way to a digital network of networks called the Internet. Like other game changing advances, digital script enabled technology found itself the chaperone of unintended consequences, the specter of all-knowingness. In many regards, the Digital Ecosystem and Digital Monoculture are no more vulnerable than were the aqueous commercial networks, transports, and cargos of centuries past. Presently, sophisticated weaponized malware renders differentiation of noble from nefarious intent a daunting technical challenge. The broad disintegration of propriety and privacy has fomented unintended consequences, the specter of gross-secrecy. All-knowingness is highly addictive. Its proponents crave access to data and information for which its owners hold reasonable expectations of privacy; they see their covert and clandestine actions as expressions of urgent benevolence and commercial expediency. Gross-secrecy is also highly addictive. Its proponents evidence totalitarian resistance to encroachment of both their contemporary and vintage stashes of secrets, believing personal risks always outweigh collective security interests. Just as all-knowingness is antithetical to privacy, gross-secrecy is antithetical to collective security. Some would argue correctly that security would be enhanced were the barons of all-knowingness to impose this knowledge on everyone with regard to those in their sphere of influence (e.g. contact lists). Others would no doubt argue that vulnerability would be exacerbated as gross-secrets were mismanaged, misunderstood, and manipulated. To varying degrees, both conditions already prevail. Neither all-knowingness nor gross-secrecy alone can serve our highest security or moral interests. It is important to recognize that neither point of view, all-knowingness or gross-secrecy, is necessarily diabolical, although such cogent consideration runs counter to our social and cultural conditioning, not to mention capitalistic instincts. It is crucial that we determine which resources can and cannot resolve this conundrum. Politics can never resolve this conundrum; politics only offers analytics but can’t run, pass, or catch. The solution must carry the essential genetic markers of the conundrum itself, technology. Recently, a government coterie (by all accounts considered technology neophytes) missed a valuable opportunity when they marched into the valley of American technology giants with cease and desist vibrato, rather than specific lawful collective security objectives. Such specificity would have allowed the participants to memorialize specific technical goals and boundaries, to which the most creative community of technologist on the planet could innovate. Now positioned as combatants rather than citizen partners, both have launched media campaigns that bring resolution no closer. Many rightfully question whether all meets the eye. The government might very well posses the assailant’s in-coming and out-going communications Meta data, iCloud backup, social media postings, radicalized training CV, and finance, relationship, and travel history. Could the Administrations petition, based on the All Writs Act of 1789, also seek to weaken limitations imposed by recent lawfully enacted legislation: 2015 Cyber Information Sharing Act (CISA), 2015 Modified US-EU Safe Harbor Privacy Framework, and the 2015 Revised Patriot Act? Do American technology companies fear being labeled as conscripted informants of the U.S. government by their global competitors more than they fear U.S. government demands as a harbinger of future demands by other governments? The most recent outbreak of conundrumitis evidences a disastrous breach of best practices. Politics has cast itself in the role of technologist, issuing specific court sanctioned technical directions. Technologists left with but two courses of action chose the path of lawful resistance over technical submission, challenging the constitutionality of the Attorney Generals petition. Self-inflicted wounds are now running neck-and-neck with those realized from attacks and assaults by perpetrators. How to get members of team-america to focus more on an effective game plan than on who is captain or who will get the loudest applause, is actually the most dangerous and challenging conundrum we face. Learning to discern the difference between a call to a state of being and a call to a state of action is one of the most challenging of insights to attain. Kinetic activity is appealing to the will and self-affirming to the intellect, whereas being speaks to conditioning of the will and subordination of intellectual inclination. While the soul is the capital of both states, the question isn’t which state befits the season or circumstances, but which spirit, truth or deception, preserves jurisdiction.